Fall is here and full of gorgeous days. I often catch myself saying, “What a beautiful day?” Fortunately there are many things a gardener can do to purposely be outside and take advantage of the cool weather. Your lawn can be the largest benefiter. Cool season grasses benefit most from a fall application of N-P-K. The fertilizer will prepare the grass for winter and growth when spring arrives. I have to admit, I have lawn envy. I love a lush green lawn and often gaze and admire our neighbors beautiful lawn. A healthy lush green lawn is the result of a correct fertilizer program, adequate amount of water and mowing at the right height. I know my goal and how to do it; I just don’t have the time to keep up with the Jones’s right now. 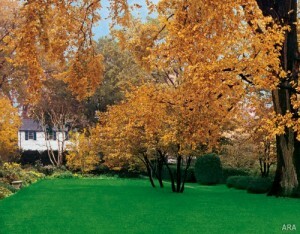 The lawn depends upon three major nutrients: nitrogen, phosphorus and potassium. Nitrogen (N) is your number one friend when you want green grass. It promotes a thick green lawn. Phosphorus (P) toughens the roots and foliage of the grass. Potassium (K) strengthens roots, which helps in disease prevention and stress tolerance and is especially important in the fall. You can purchase two types of lawn fertilizers: granular and liquid. Nitrogen, phosphorus and potassium are listed in three digit numbers. Each number is a percent of the element with-in the bag. A 5-10-5 fertilizer contains 5 percent nitrogen, 10 percent phosphorus and 5 percent potassium. The other 80 percent is a mix of micronutrients and filler material. Be sure to follow label instructions when applying the fertilizer to your lawn. As you know, I always include my children in yard work and gardening, but this is one time that I do not allow the girls to help. After the fertilizer has been applied and watered in and the lawn is dry, the girls are allowed back in the yard to play. Now it’s my turn. I’m wearing my flannel shirt, jeans and gloves and heading out to enjoy the fresh autumn air. Maybe, just maybe, this will be the year my lawn is greener than the neighbors.